Looking at 50s and 60s movie ads this week. 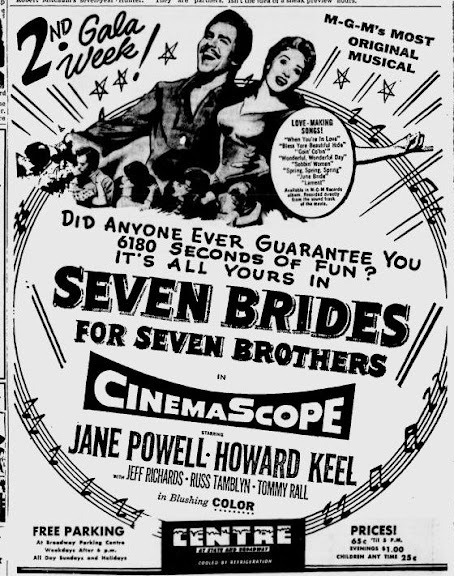 Here's the ad for Seven Brides for Seven Brothers from 1954. One of my wife's favorties, I watched it a few years ago. Not that good. Howard Keel is the eldest of seven brothers. He meets Milly in town who, surprisingly, is also the eldest of 7, and convinces her (somehow) to marry him that very day. And also have her 6 sisters marry his 6 brothers. The main character played by Howard Keel is kind of an insufferable douche bag. I don't know why Jane Powell married the SOB. Especially since she hates him at first. And then she agrees to marry off her 6 sisters. WTF?! Just an odd movie.